Designed by California architect Gilbert Stanley Underwood, Marysville’s Union Pacific Railroad Depot (1928-1929) is located adjacent to the former railyards on 7th Street, two blocks north of the downtown business district. The asymmetrical stucco, brick, and terra cotta building is of the Spanish Revival style. The single story steel-framed building stands on a reinforced concrete foundation and is roofed with red clay tiles. 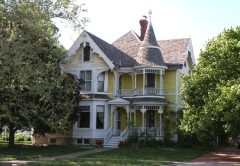 The depot is significant for its historic association with the growth and development of Marysville, Kansas, and as an excellent example of a Spanish Revival passenger depot. 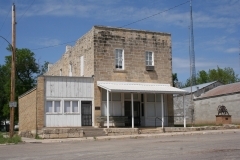 Regular passenger service was suspended in 1955, after which time the building continued to house offices for the railroad. The Union Pacific Railroad declared the depot surplus property, intending to demolish it. 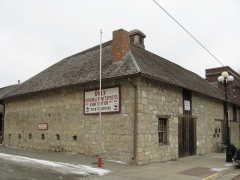 In 2015 a joint effort between the City of Marysville and the Union Pacific Depot Preservation Society saved it from demolition, and work commenced to restore the building and make it a community asset. The Pacha Ruts were nominated for their association with transportation and exploration/settlement along the combined route of the Oregon and California trails and for their association with the Pony Express. 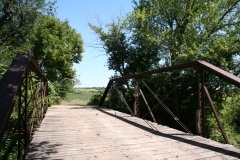 This trail remnant is located in Marshall County on the western end of an approximate 133-mile branch known as the St. Joe Road, a connector route between St. Joseph, Missouri and the Independence Road. Active between 1844 and circa 1860, the St. Joe Road joined the Independence Road approximately 1.5 miles northwest of this nominated site. 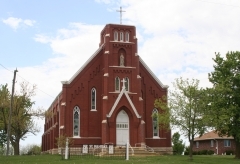 This route was mainly utilized by emigrants from the St. Joseph and Weston, Missouri areas. 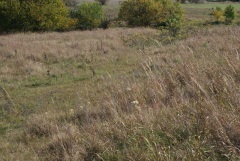 The trail remnants at this site were also used by the Pony Express riders in 1861 as they made their way to Hollenberg Station in present-day Washington County. Located at the north end of Main Street in Summerfield is the Transue Brothers Blacksmith & Wagon Shop, which traces its roots to 1889 when blacksmith Thomas Hutton first opened a shop at that location. 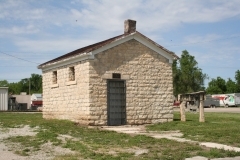 He sold the business in 1893 to brothers James and George Transue, who erected this fireproof limestone and brick building in 1898. 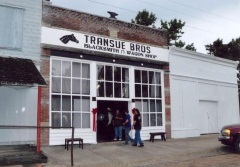 The Transue brothers provided a variety of services to the community that included horseshoeing, building and repairing wagons and sleighs, and iron fabrication. Their business and the buildings out of which they operated adapted to changes in technology and to meet consumers' needs. The early twentieth-century shift away from horse-drawn wagons toward automobiles is evident within the farrier's shop where the brothers converted the shop into an auto repair garage by digging a pit in the floor over which cars could be parked for repair to the undercarriage. The nominated property includes three functionally related buildings that were erected between 1898 and 1911: the blacksmith and wagon shop, the farrier's shop, and the coal shed. 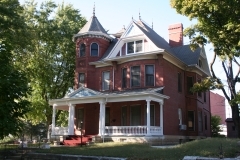 They were nominated for their association with local commercial history and their architecture.